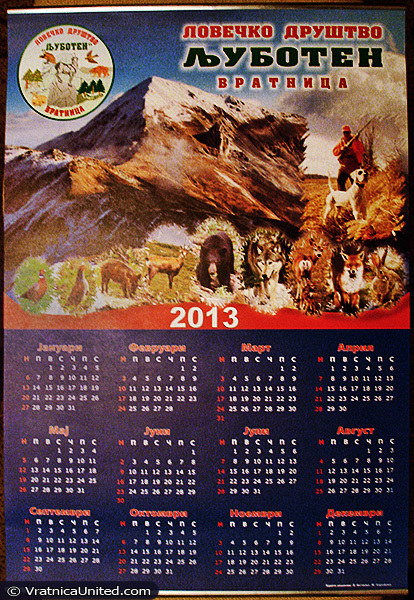 During February the Hunting Association “Ljuboten” from Vratnica gave ‘Calendar of 2013’ to all its members – hunters. Below you can see the design of the wall calendar. Check out the… Invitation for Vasilica lunch 2013 in Vratnica. Date and location of the event: 26th of January 2013 (Saturday, 14:00), St. Petka church – Vratnica. In this article you can see the… Announcement for Epiphany (Bogojavlenie) – Vodici 2013 custom in Vratnica. This year’s Vodici ceremony (19.1.2013) will be held at St. Petka church in Vratnica, and then at Rakita River (12:30 PM). VratnicaUnited.com wish you Merry Christmas and Happy New Year… with the song “New Year” by Vratnica dance music trio Musical Wizards. The song “New Year” was recorded at the end of the 1990s. Musical Wizards members were: MC DJ Veki, Alex De La Force and MC Wink-Oh. There are many Vratnica related websites online. Vratnica is present at the social networks, too. We wrote about that in this post. Some time ago, we started Vratnica Channel at YouTube. There you’ll have chance to see many videos related to Vratnica and its surroundings. Please subscribe if you want to stay updated. For now, we just uploaded one promo video. You can see the video below. Few weeks ago we published 30+ photos from “VRATNICA 2011” sports tournament. Currently we are working at the photo gallery from Vratnica Slava – Kostanovden. After this, VratnicaUnited.com plans to start republishing over 500 old Vratnica related photos. Most of them previously were part of at Vratnica.5u.com website. Due to the old servers at “Cyber VRATNICA” site, some of the photos are gone. We decided to republish the whole old photo archive, many beautiful pictures and memories starting from 2001.